The economy is making it difficult for families to pay for college, which could cost private universities and colleges. The economic downturn is forcing private colleges and universities to rethink their admissions process. While the number of applicants is going up, it is getting harder to figure out how many of the admitted students will actually enroll. That's because more families are tightening their budgets and finding it increasingly difficult to pay for college. 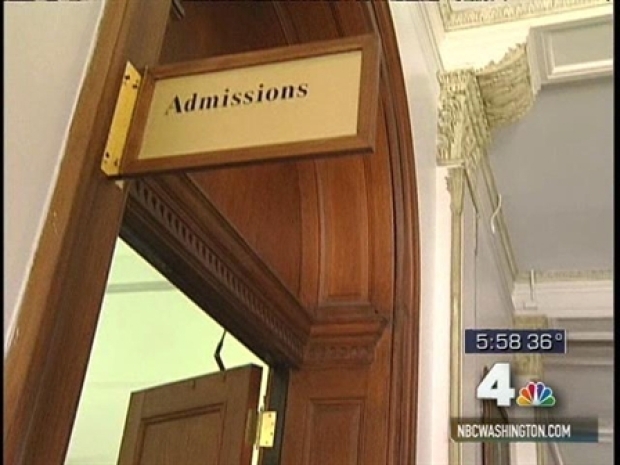 Marymount University in Arlington is seeing families who didn't apply for financial aid last year applying this year. School officials are working with students and families on a one-on-one basis to ensure that they take advantage of every loan, grant and scholarship available to them. At Catholic University in northeast Washington, admission officials are recruiting harder and reaching out to potential students. Mike Hendricks, the vice president for enrollment management, said schools are under pressure to put more money into financial aid -- merit scholarships and need-based aid. One student said she has just applied for her fourth loan. Plus, her younger brother and sister are starting at Catholic as well. She said her family is struggling right now. The university said it will have to accept more applicants to make sure enough students enroll this fall.